As Eric explained in two previous posts, after he accidentally fell into the water while taking out the trash, we decided we needed to make a few changes to our boarding practices. 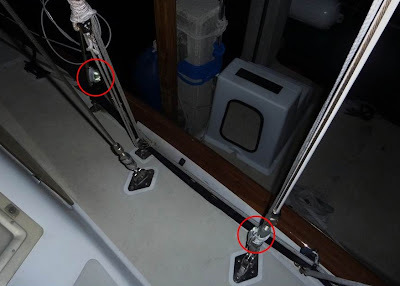 The very first thing we did was commit to paying attention to what we are doing while getting on and off the boat (the root cause of why Eric slipped). Next, we rearranged our lifelines, so they were less cumbersome, and we installed a set of secure boarding steps, which makes boarding during high tide less of a gamble. While not blinding, the light put out by these lights is just bright enough to cut through the darkness and help us see precisely where (and where not) our feet should go. They are our boat's equivalent of a porch light. So far, boarding in the dark has proven uneventful. And considering we'll soon have some very precious cargo in our hands, we want to keep it that way. But What About Keeping the Baby in the Boat? Coffee Service Begins at 0700.